All prices include vat and FREE 1st Class post service as standard. When using the Printanet Design Templates please type all appropriate printing details into the special instructions box on ordering. If you don't see what you want please contact us. Whether it's business cards, letterheads, compliment slips, leaflets, handouts or any other printed material, you've come to the right place. Printanet offers you a top-quality design service – see samples of Our Work but don't just take our word for it, here's what some of our satisfied clients have to say Customer Comments. With over 25 years experience in the printing arena and using State-of-the-art technology, it's not surprising that our printing services are the best around. Our user-friendly website allows customers to send us their own designs or use the many templates on offer to create the finished product. 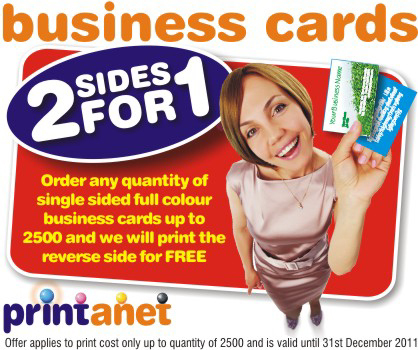 Whether you're a small business, a large corporation or just want something printed for yourself, our helpful, highly-trained staff are on hand to provide advice and assist you with all your printing requirements, from business cards, booklets, compliment slips, leaflets, letterheads, canvas prints, plus a host of print design services. Our prices are highly-competitive and we also offer a FREE delivery service to cities and towns nationwide. If you'd like to talk to us about your specific printing requirements, or need some help or assistance, we'd love to hear from you. Why not Contact us today?